Oppo built its reputation a dozen years ago by launching “play anything” disc players at a fraction of the price of the big names like Denon or Pioneer. By “play anything” I mean that these machines could play Super Audio CDs (SACDs), DVD-Audio discs, traditional video DVDs, and later Blu-ray discs. I know from personal experience in the design of Boston Acoustics’ Avidea 770 system that this is really challenging, because the different disc technologies require everything from different disc controllers to different laser light wavelengths to different decoding chip sets, not to mention dealing with MANY dozens of technology licensing companies like Dolby or Fraunhofer IIS or the DVD Consortium. So when I saw that Oppo was making a high-end-but-reasonably-priced headphone amplifier and digital-to-analog convertor (DAC) for computers and smartphones, a device that could play FLAC, Ogg-Vorbis, DSD and various other audio formats and have a variety of connection options, I knew it would be a great performer and would be well thought out. I was not disappointed. I believe the earlier HA-2 and new HA-2SE hold particular relevance for the iPhone 7 and iPhone 7 Plus since these new phones lack headphone jacks. Consumers these days are used to getting all sorts of stuff in the box whenever they buy electronic products. Besides the engaging safety documents and instructions in 275 world languages, you often get a bunch of cables of which you need one and the rest go in a drawer. I’m partially joking of course, because it is very thoughtful of manufacturers to include a wealth of connectors and doodads so I’ll be guaranteed to success in hooking up the device. Oppo, too, included a bunch of wires, but a short lesson in “how you connect a DAC headphone amp to your phone” to appreciate what they’ve done that competitors have not. I’ll explain this with the iPhone in mind, but it’s the same for an Android phone. First, some terminology. When you charge or sync an iPhone, you use a cable with a USB-A plug (a metal rectangular plug about a half-inch across) at its “source” end that goes into the USB-A receptacle on your computer or wall charger. The destination end of a cable has a “male” (it identifies this way) Lightning connector that plugs into the Lightning receptacle on the phone. These Lightning charger cables are pretty common — if you have an iPhone you probably have a few of these cables. With most DAC headphone amp products, you can’t use this cable; here’s why. The DACs also depend on a USB cable to hook to their source, which most classically is a computer. Such a DAC, as with the FiiO Q1 which I’ll be reviewing separately, requires a cable with a USB-A plug at its source to go into the USB-A receptacle at the computer. 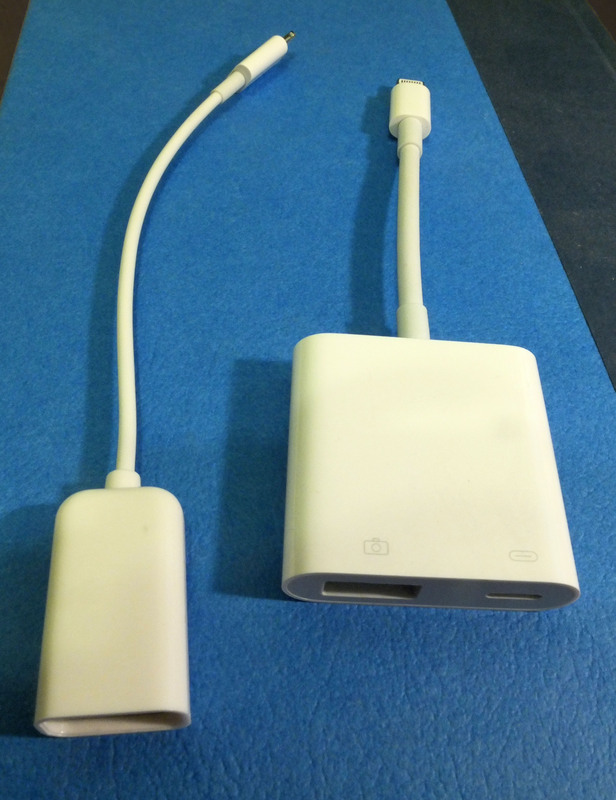 At the destination end of the cable is a USB Micro-B plug to insert in the receptacle on the DAC. This exact same cable is what most non-Apple products use as a charging and syncing cable. The problem arises when you try to take a DAC headphone amp and hook it to your phone directly. You have two “destination” devices, and the standard cables leave you trying to put two USB-A plugs together. This adaptor essentially puts a USB-A receptacle on your iPhone or iPad. Now you can plug in all sorts of USB-connected devices directly into the iPhone kind of like it’s the computer now. 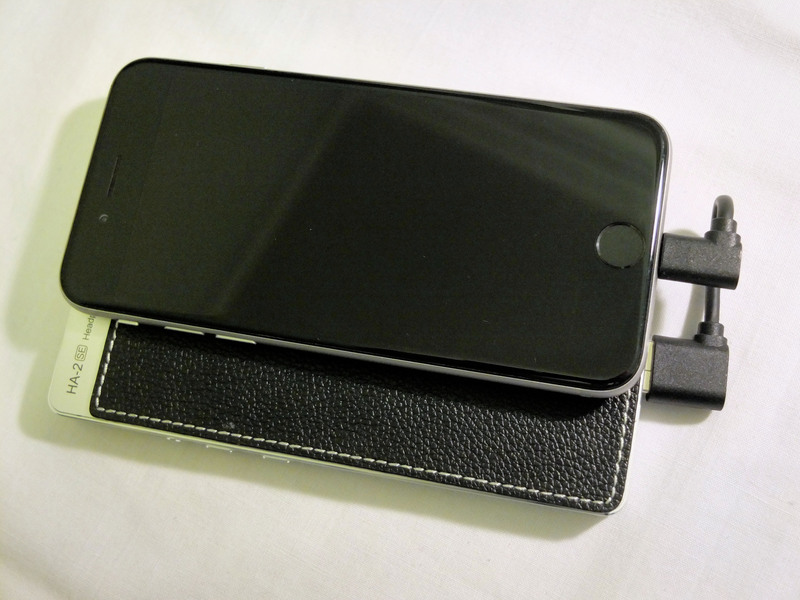 For most DACs, you connect DAC to regular USB cable to adapter cable to iPhone. It’s a pleasure to carrying all this around for mobile listening. Seriously, I commute to work on public transportation, listening all the time, so avoiding a lot of extra wire is important to me. Oppo solves this mess by putting a USB-A receptacle jack on the HA-2SE itself. In effect, they are using the USB jack backwards. While it has the receptacle jack, the Oppo is destination. You can just use a regular old Lightning charger cable that you use now for charging. The Oppo is essentially acting like a sound dock for your phone. In the box, Oppo thoughtfully includes an itty-bitty USB-A to Lightning cable so you don’t end up with a lot of bulk. They include the comparable little wire to use with an Android phone. I enjoyed the Oppo HA-2SE a lot. What struck me most was that percussive sounds were more percussive, and the sound in general, particularly the upper range, was more lush (my word for a combination of detail and delicacy). The original mix, in a DSD 192 MHz/64Fs mix, per the Acoustic Sounds website, “mastered by Doug Sax using an all-tube system. Overseen by Bruce Botnick, The Doors producer/engineer.” By design, based on what I’ve read, this version is very true to the original full length variant from The Doors’ first album. A slightly different stereo re-mix, from the 2008 The Future Starts Here: The Essential Doors Hits. This version positions instruments and voice the same, but is considerably more open and clear sounding. By comparison the DSD “original” is considerably darker sounding. To my ear, the readily available (i.e., streaming services) 2008 version is more appealing. The Apocalypse Now! Redux soundtrack version, an update of the original film mix, that is considerably different in that instruments are panned closer to center with reverberation added to give spaciousness, rather than the album mix which has instruments like percussion and bass panned to left and right to create a soundstage. I didn’t attempt to listen to a 5.1 version as would have been found in the 70mm release or later Dolby Digital/DTS/SDDS releases, as that would be tricky to do meaningfully with headphones. I also listened to the opening of the song, rather than the denser later parts, and to two sequences in particular, the entrance of percussion and bass in left channel, and Jim Morrison’s vocal entrance. In the case of the DSD version, I played if from the Onkyo HF player app, which can pass DSD program in DoP format (DSD over PCM) to products like the Oppo which are capable of decoding this stream. Comparing to just the plain old headphone jack (on phone or the Lightning adaptor in the case of iPhone 7 / 7 Plus) the sound was cleaner, and the tambourine smoother and less shrill and brittle. Frankly the 2008 “stereo re-mix” showed more of a difference. Is this because the “best quality” Rhapsody/Napster stream actually needed more help, and got it from the Oppo? I don’t think so, as the newer mix sounds better than the DSD no matter how I listen to it. I am sure some would consider this a heretical statement, but the song is plenty dark without a dull haze over the vocals in particular. I strongly believe that once the digital codec format is adequate enough to not affect sound, (256 kbps mp3 qualifies), the mix and mastering make a much bigger difference that exotic codec variants. In the stereo remix the kick drum (timed to the bass) and tambourine enter in the left channel with more punch, clarity, but at the same time smoothness, listening through the Oppo. The bass in particular has more impact than the iPhone Lightning adaptor, or the Fiio Q1 I was auditioning, for that matter. The DSD version actually has more artificial reverb, seemingly to make up for the duller balance, in a sense reflecting the instruments panned to left channel with a reverberated version in the right channel. The Oppo was a fun tool for making these sorts of comparisons. I should mention my listening was with the beyerdynamic T 51 i, which is a very neutral listening reproducer, an unusual quality in the age of Beats with big booming bass. 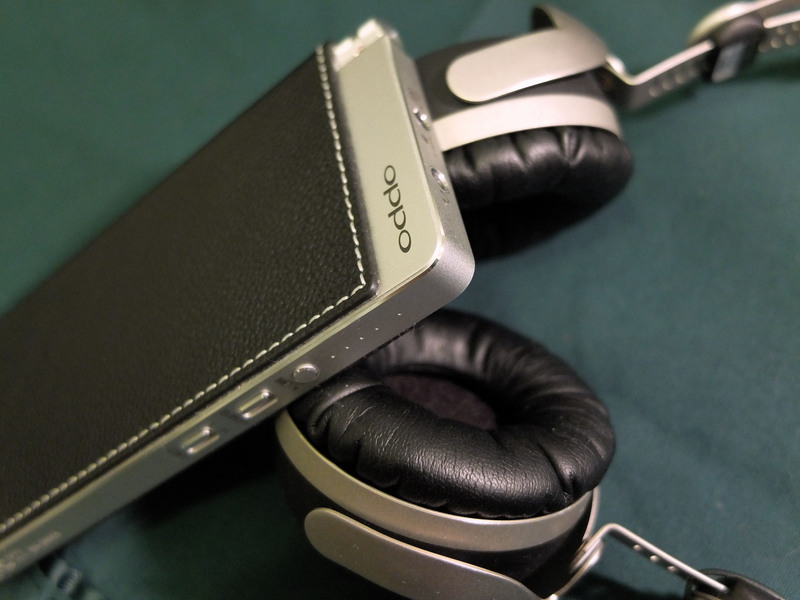 I enjoyed listening with the Oppo HA-2SE, and as long as I have a jacket pocket, I enjoy using the Oppo on the go (I didn’t try its fancy rubber bands and pad that are designed to lash it to an iPhone). It’s a pleasing system to hear, one I would use long term. Did I mention, it can charge the phone as well? That’s handy when you are streaming audio over a cell connection and drawing down your battery. You can’t use your headphone’s volume or play/pause/forward/back controls, or the microphone for that matter. Your special “made for iPhone” headphones or earbuds won’t have any special phone functions. I can’t emphasize enough the significance of products like the Oppo HA-2SE now that the iPhone 7 and iPhone 7 Plus lack a headphone jack, leaving you only with the included Lightning to headphone adaptor or Bluetooth. If you are interested in good sound, and particularly if you’ve made the investment in high quality headphones or in-ear monitors, the Oppo HA-2SE is a great companion to your iPhone or Android. This entry was posted in Product Design, Reviews and tagged Fiio, iPhone 7, Oppo, Oppo HA-2, Oppo HA-2SE by Stephen. Bookmark the permalink. Ken, thanks for your questions. As for the Audioquest, I haven’t tried it but I know it is well regarded in terms of sound. The Audioquest has the advantage of lower cost and smaller size. The Oppo has the advantage of the built-in battery, so rather than taking extra power from your phone it’s actually able to recharge it. I listen to a lot of streaming audio over cellular, which kills the battery, so to me the recharging is valuable. I have a hard time seeing the benefit of either the Oppo or Audioquest in conjunction with the Onkyo receiver. If you mean between the phone and receiver, there’s really no point to connecting the headphone output of a DAC to the input of the receiver, where the sound will immediately be sent into an ADC (analog to digital converter). You would be better off with a direct digital connection from phone to receiver via a Lightning to HDMI adapter. I think this would work well although I’ve never tried it. If you are meaning to use the DAC on the output of the receiver, such as to drive headphones, there isn’t any way to connect any USB DAC to that Onkyo because it does not have a digital output compatible with USB DACs. Hi there — Amps and receivers fall into two categories, for the most part. AV Receivers — those with surround sound decoding and video processing built in — by and large are fully digital internally. All incoming analog audio, even phono for the rare products that support turntables, gets converted to digital. All the processing necessary in an AV product, like equalization (bass/treble/room eq like Audyssey), time alignment (for speaker distance), and even the volume control are fully digital. An internal DAC precedes the amplifier section, or in the case of “digital” amps, the amp itself is effectively the DAC. In some high end receivers, there might be some kind of analog “pure audio” bypass, but this is really rare, and would be called out on the spec sheet. Keep in mind, to do this, there would need to be a redundant signal path including volume control. In the case of most of these AV receivers, using a fancy DAC before them is kind of a waste. A direct digital connection will be far superior. Stereo amps (pre-amps, power amps, or integrated amps that combine pre & power) are more likely to be fully analog (although there many are exceptions). Usually this is pretty easy to tell from the product description and spec sheet. In this case, input selector, or volume, or bass/treble if it’s included, will probably be old-fashioned knobs turning metal shafts connected to mechanical switches and analog potentiometers, a.k.a. a variable resistor as would be used for a volume control. In the case of purely analog products, preceding them with a high quality DAC for your digital source has much more value. I ordered a iphone 7 and as I understand the lightening cable that comes with the apple iphone7 has a small DAC built in to the dongle wire itself- which I am sure isn’t of high quality- and am I to understand the HA2se will by pass all apple dacs including the internal one (if any) inside the iphone 7 and use only the Oppo DAC? This seems like a simple question, but really, I want to know if the sound on the iphone 7 paired with the oppo will yield the highest quality compared to a say a iphone 6 with same pairing. Are the ppl at apple making it harder for us to get clean digital outs w/ iphone7? Hi John – I suspect the sound will be the same between an iPhone 6, 6s, 7, etc. or recent iPads for that matter. This is because they would be storing the same file and sending it to the Oppo digitally. The only reason there possibly could be a sound difference is (a) if one of them can handle a higher bit rate / sampling frequency (but I don’t think they are spec’d differently in this regard), or (b) if one of them claims higher precision or lower jitter (I am aware of no such differences between those models). Also, to answer your question about the Oppo bypassing DACs in the phone, yes that is exactly what it does. The iPhone 7 does have a DAC, but only uses it to put audio out of its built-in speakers. I hope this all helps – thanks for your question. User update: For the record, it’s worth noting that the Oppo does have one issue that arose from time to time — electromagnetic interference that was reminiscent of the old TDMA noise you would hear putting an AT&T network phone near an audio product. Remember back before 3G and LTE networks appeared you would get some pretty awful noises out of audio products (like a car stereo or home hi-fi or even a speakerphone) if the phone was near by? Well I have noticed I occasionally get a mild version of this with the Oppo HA-2SE. I never noticed this with the Oppo HA-2. The noise is not so loud, and occurs when the phone (an iPhone 6) is close to the Oppo — and probably when the cell service is poor, meaning the phone is hopping networks. But it does happen and it’s kind of annoying. Just something to be aware of. Is this issue (electromagnetic interference) that arose from time to time only a problem when you’re streaming music with poor cell service? Or can this be a problem with playing music that has been ripped from CD and synced with Itunes to an Iphone 7? I’m a bit concerned that “stacking” the Oppo HA-2SE and my Iphone 7 could be a problem now with listening to all of my CD’s ripped and synced to my Iphone 7 as this is the majority of my listening. Thanks for the wonderful article and analysis of the DAC. Just quick question; did you happen to test the OPPO HA2 with iPhone 7/7 Plus? 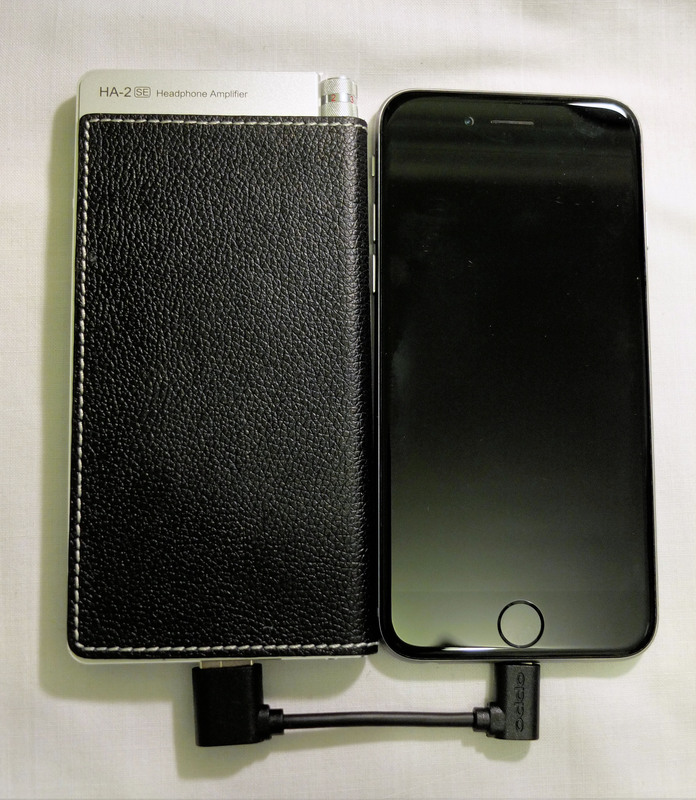 I own the HA2 and am planning to get an iPhone 7 soon, but I am a bit skeptical about the devices being compatible. Also, is there any live streaming service that can work with external DAC, say Tidal for example? In my experience, any audio that plays on an iPhone would work with an external DAC and the iPhone. This includes streaming services. I don’t own an iPhone 7, but I am sure it works fine playing a streaming service like Tidal through an external DAC like the Oppo. I’m using the HA-2 and HA-2 SE for over a year now and I must say that the audio quality is more then fine, but I suffer from a few issues regarding the connectivity from the device with the iPhone 7 and the quality of the cables included by OPPO. 1. The cable OPPO delivered together with the HA-2 to connect to an iPhone is not capable doing his job for more then a month. I used two of them on the go and both gave up very early. I must say that the OPPO needs a flawlessly operating cable; I have used now 4 cables in one year now, because by bending the cable every day it’s causing operational stops of the music frequently. 2. I don’t know if this has to do with the iPhone or the OPPO, but when I listen to music in flight mode there are hardly issues listening to music, but when 4G and telephony is reenabled again, the music is getting disconnected frequently. Especially when the phone is changing from Edge/GPRS to 3G/4G the phone tends to stop the music. 3. When you use the OPPO on the go the connections on the device are located on an illogical spot. The headphones are connected on the top end of the device and the lightning cable is plugged in the bottom side; so there is always a cable got squeezed in your pocket or jacket. When the two cables would both be situated on the topo side, there would be no problem when you stick the device somewhere when you’re on the go. Since the issues occurred with both models, I would say this is not a ‘Monday morning product’ failure, but something inherent to the model itself. Do you know any of the issues as described above? Hi Kaj – thanks for your note. I agree, the opposite-end cable issue is kind of annoying, and in practice I found it annoying to end up with a wad of wire in my pocket. Regarding intermittent connections, one simple issue has caused me to think several cables were bad — with both the old 30-pin connector type, and the newer lightning connector cables. The issue is lint from your pocket. It gets in the connector hole and then gets jammed to the bottom when you insert the cable. Turn the phone off and delicately use a thin wire (I used a small bent paper clip) and scrape out any lint. You might be surprised how much this helps! Of course be careful not to trash the electrical connections. Finally, as for Edge/GPRS, if you are going in and out of that mode it doesn’t surprise me that you have some issues. That old connection type was famous for throwing interference into all kinds of audio products — a real nightmare for designers.